A self-assured and witty performance by SUSU's very own Theatre Group. Considering this was my first theatre show by an amateur theatre group, my expectations entering the theatre for The Annex’s first show of the academic year were lower compared to the professional productions I’d seen before. However with strong performances from Emma Frazzitta and Jordan Gardner, and the comedic quips of Ian Bessant, Theatre Group’s Blithe Spirit ended up being a very charming, hilarious and beautifully executed production. Noel Coward’s comedy tells the story of novelist Charles inviting a medium, Madame Arcati to his house to conduct a séance. Convinced she’s a charlatan, he uses the arranged meeting to gather material for his next book about cons. This backfires when the ghost first wife, Elvira returns to haunt him. The cast and crew ensured that the SUSU Theatre Group set high standards for sets, sound effects and clever stage effects at the very end. Jordan Gardner lends Charles an air of self-centredness and authority. He’s seemingly not too bothered after initial shock of the return of the ghost of his first wife. He assumes he is in control of the situation. However the actions of Elvira, Madame Arcarti and the understated Edith (Katherine Quinn) are what carries the story. Charles manages to connect with the audience the most as he is at the mercy of bad-tempered wives for most of the play. The outstanding performance, however, comes from Emma Frazzitta (Ruth) who portrays an elegant wife whose love for her husband is already beginning to dim into bitterness and quickly becomes jealous upon the arrival of Elvira. Emma Frazzitta provides a constant air of dissatisfaction and mild disdain throughout the play. Her witty exchanges with Charles provided great dialogue. Samantha Sharp plays Elvira, a cunning and mischievous ghost who poses a sexual threat to Ruth, managing to have an intimate moment with Charles very soon after her arrival. Whether it’s the all-white look or the charms, Charles is seduced and very quickly tries to be accommodating. The other characters, the Bradmans – played by Ian Bessant and Mazzy Westwood – provide great comic relief when they appear. Not particularly important to the story, Mr Bradman’s frustration at Madame Arcarti during the séance scene was one of the funniest of the show. Mrs Bradman’s drawn-out annoying laugh is noteworthy if nothing else, successfully portraying a doting wife who is meant to come across as annoying and over the top. Will Shere plays Madame Arcati and seems rather forced in comparison. It is clear that he has a more difficult role having to increase voice pitch and generally portray a flustered character who takes her business seriously. But Arcarti comes across as too much of a caricature/character and it is hard to buy into. Overall, a great way to spend the evening, the whole production has an assured style and wit about it that theatre was filled with laughter which was at times too much for the actors themselves. For other shows by the SUSU Theatre Group visit http://theatre.susu.org. 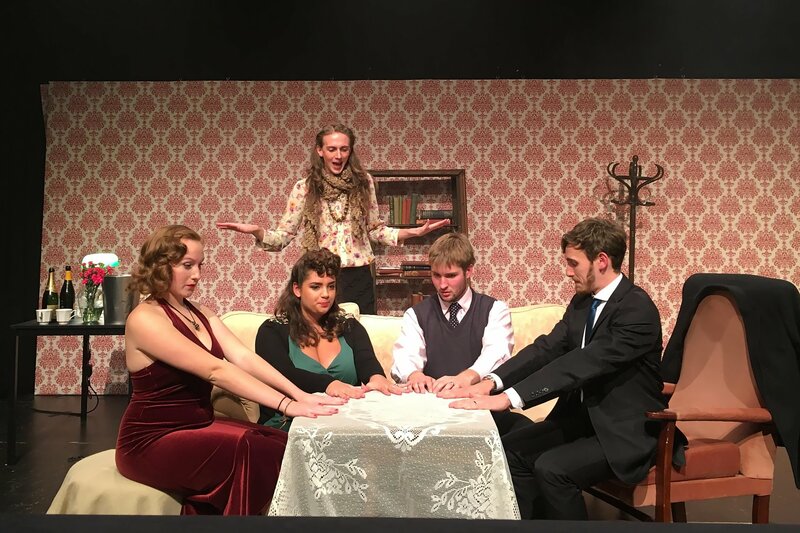 Watch this clip from a production of Blithe Spirit at Stratford.